The Dong Feng 21D, or DF-21D, is a medium ranged, road mobile, ballistic missile developed by the People’s Republic of China. A variant of the DF-21A, the DF-21D was deemed operational in 2012 and is the world’s first anti-ship ballistic missile (ASBM) intended to attack ships at sea. [i] Reaching speeds up to Mach 10 during the terminal phase, the DF-21D is the fastest MRBM to date and can surpass existing U.S. missile defense systems such as the sea-based AEGIS ballistic missile defense (BMD) system. [ii] In 2013, the DF-21D was tested against targets equivalent to U.S. surface ships which proved to be successful. [iii] By using both inertial and radar guidance systems, the ASBM increases speed upon reentering Earth’s atmosphere to avoid missile defense structures and ensure a direct hit on moving sea-based targets. 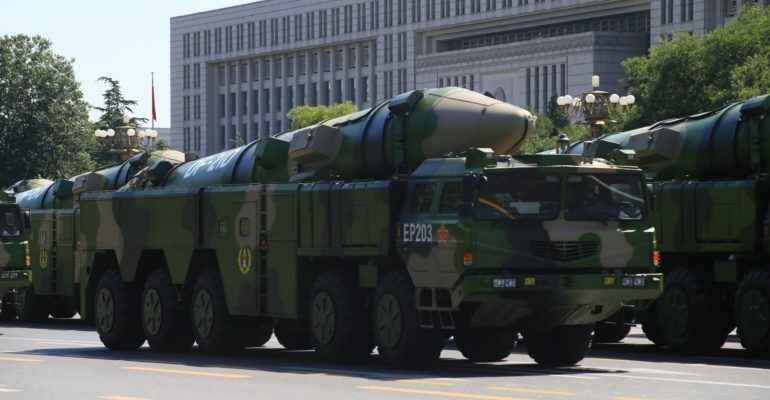 [iv] A variant of the DF-21D is currently in production with intentions of increasing its range and payload.